Street Address No.5, Ziqiang 3rd Rd., Lingya Dist. A stay at 85 My House places you in the heart of Kaohsiung, steps from Tuntex Sky Tower and 4 minutes by foot from Kaohsiung Public Library. Featured amenities include luggage storage and an elevator (lift). With a stay at Flowering Buds Bay in Hengchun (Big Beach), you'll be minutes from Kenting Night Market and close to Kenting National Park. Free self parking is available onsite. 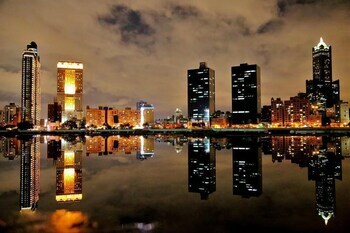 With a stay at Ruei Gung Business Hotel in Kaohsiung (Sanmin), you'll be within a 15-minute drive of Kaohsiung Museum of Fine Arts and Dome of Light. Located in Ren-ai (Wushe), Huis Ten Bosch is convenient to Cingjing Farm and Small Swiss Garden. Free self parking is available onsite. With a stay at Fu Chuan Garden Homestay in Nanzhuang, you'll be within the vicinity of Mingde Dam Scenic Area and Yimin Temple.